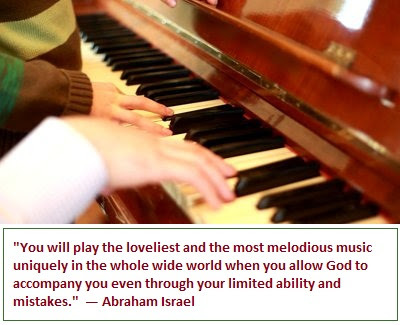 Wishing to encourage her young son's progress on the piano, a mother took her boy to a piano concert. After they were seated, the mother spotted a friend in the audience and walked down the aisle to greet her. Seizing the opportunity to explore the wonders of the concert hall, the little boy quietly got up and eventually explored his way through a door marked "NO ADMITTANCE." When the house lights dimmed and the concert was about to begin, the mother returned to her seat and discovered that the child was missing. Suddenly, the curtains parted and spotlights focused on the impressive Steinway piano on stage. In horror, the mother saw her little boy sitting at the keyboard, innocently picking out "Twinkle, Twinkle Little Star." At that moment, the great piano master made his entrance, quickly moved to the piano and whispered in the boy's ear, "Don't quit. Keep playing." Then leaning over, he reached down with his left hand and began filling in a bass part. Soon his right arm reached around to the other side of the child and he added a running obligato. Together, the old master and the young novice transformed a frightening situation into a wonderfully creative experience. The audience were mesmerized. Remember that is the way it is with God in our lives too. What we can accomplish by our own talents are never noteworthy. We go in to unknown places by faith and we start to do something with what we have inspite of the risk we face constantly. God who wants to show Himself to all others around us, shows up on stage and encourages to "open our mouth and promises to fill it with words" (Psa 81:10). As we start to speak words with hands trembling and sweating, God starts to speak through us and ministers to the need of the people who have come expecting His Word to speak to them (Gal 4:13-14; 1 Cor 2:3-5). The same happens when we use whatever talents we have by faith for the glory of God. God joins in and uses us mightily for His Glory. With the hands of our Master God Jesus playing his genius with us in partnership, truly our life's work will become beautiful. The next time your seem discouraged thinking, what talent do I have to serve the Master, listen carefully to the voice our Master Jesus speaking to you in your heart, "Don't quit, Keep doing what you can." Then you will feel His loving arms around you, carrying you and using you for His Glory. With God all your feeble attempts will become masterpieces that will mesmerize everyone around you. Remember, God doesn't call the equipped because they will take the glory for themselves and be proud of what they did on their own, leaving God out completely inspite of using the gracious gift He has given them. But God equips the called so that they will know that God is using them inspite of their inabilities and insignificance for His Glory. Remember and be bold to do what you know best for God, He will be there to lovingly guide you to exhibit His glory to all those around you. It is not your ability that God is looking for, but your availability to be used for His purpose, so that He can reveal His glory through you. Amen!!! O I have experience this so many times! I am a praise and worship leader and everytime I am about to lead or minister, I feel I didnt practice enough, or feel a scratch on my throat or just feel not confident. and everytime I tell God, to take control, to sing over me and OH MY GOD! its always amazing how it comes out and i feel it deep inside me that, that wasnt me, the pitches the annointing!! its all God. and the time when am confidednt or think i have practiced enough and can do it on my own, thats when i feel like the spirit didnt move!!! this is an amazing post! isay let go and let God! !